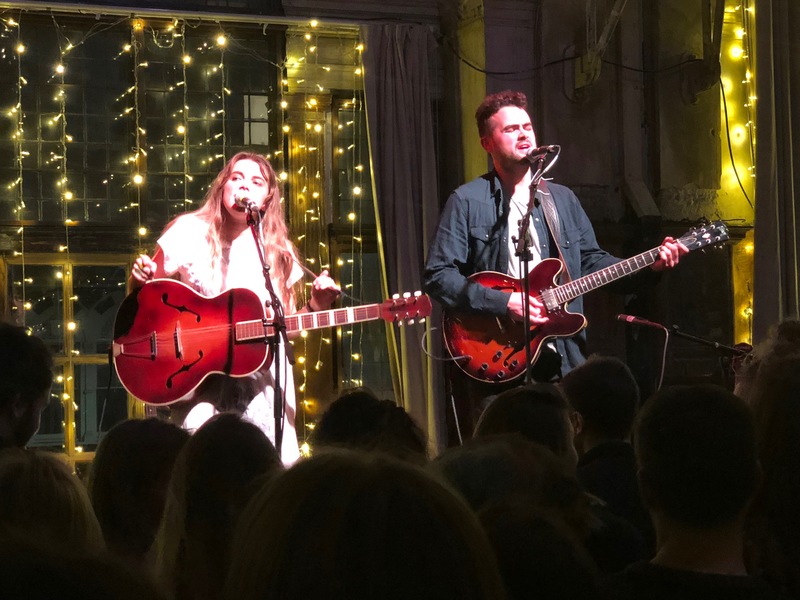 Already old timers at the Spiritual Bar in Camden, Issy Ferris and Archie Sylvester are no strangers to the London gig scene. Both performed as solo artists before taking the leap and deciding to focus on making music together almost two years ago. Since then they’ve released the four track EP The Yellow Line as well as songs including Better in Yellow and The Room which highlight their backgrounds in folk and blues. These songs are carried on a beautiful harmonica tune which fans of old country music cannot help but fall head over heels for. 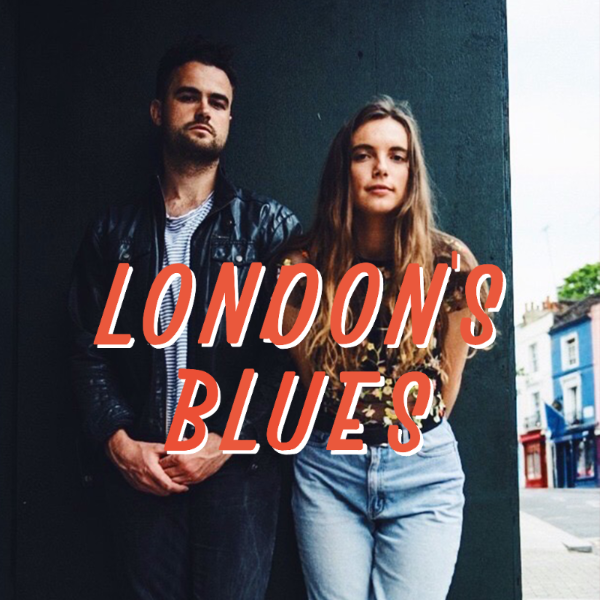 Newest single London’s Blues was released on January 5th and has already seen insane success gaining over 92,000 streams on Spotify in its first ten days. And with another EP, Made in Streatham, due early February it really seems as though there is no stopping the magic. What can we expect from the upcoming EP? 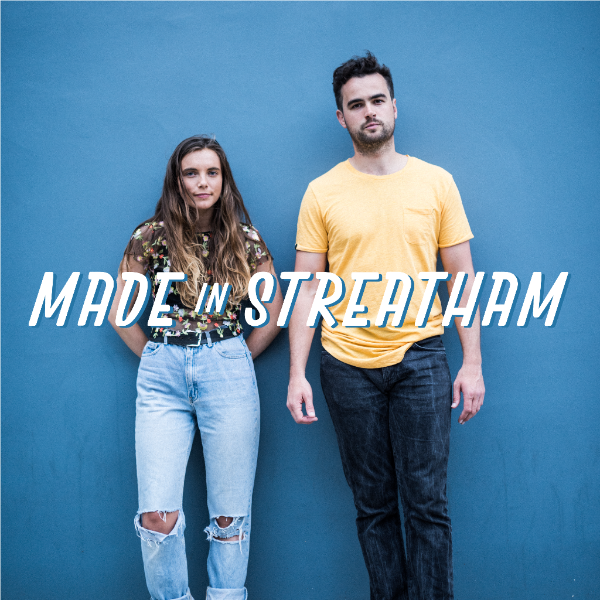 Issy: Well, the EP it’s called Made in Streatham and Archie and I actually produced, wrote and recorded it all in our flat in Streatham, hence the name and we spent a good couple of weeks recording it. We insulated our whole kitchen and living room area and invited in all our favourite musicians. Like the trumpet player tonight is on there and a cellist, drummer and a bass player. They all came in and we recorded it in our slippers, whilst I was knitting most of the time! Having a nice time. It was really, really fun. What was it like living amongst recording at the same time? Archie: You should ask our housemate really instead of us, it was absolutely fine for us! Our housemate Adam, is coming tonight actually, so maybe we should give him a shoutout. Ha, yes for surviving the recording! I don’t think he had any idea what he was walking into when he came into the kitchen and there was a gazebo up with a drum kit, recording equipment all over the place and he couldn’t even get into the kitchen to do any cooking. At least he’ll always remember his birthday this year, that’s a memorable way to spend it. Issy: Exactly! I think we made a great impression on his birthday. Archie: And his brother actually, on our latest single London’s Blues. We finished it and we just felt like it wanted something else. It’s got some claps at the end and we asked him and his brother to come in and record those claps just in our studio at home. Yes, made it! So then how would you describe your sound to our readers? Issy: To be honest it’s a bit of a mish of everything. I think we’ve made a genre of our own in a way. Archie: I would say, correct me if you disagree, one thing about our music is we’re coming at it from different angles so it’s always meeting and moving. 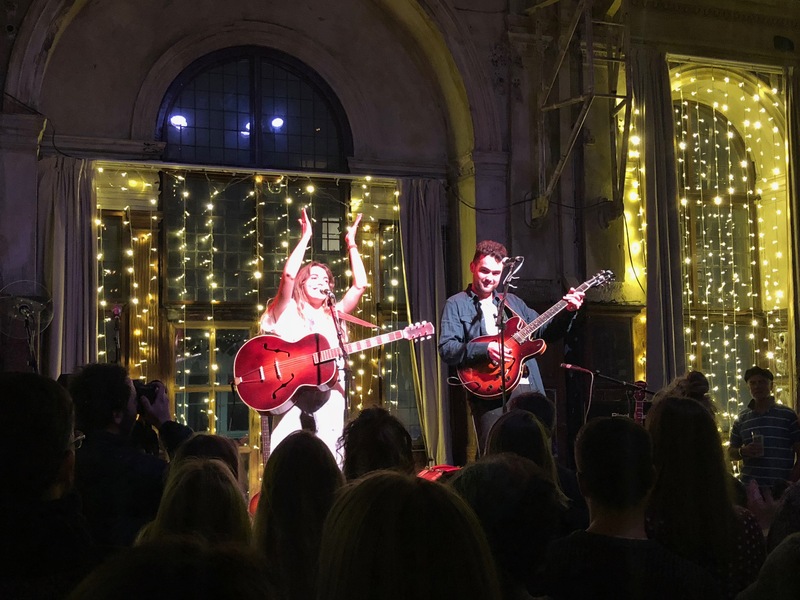 Issy started off as quite a folky singer and I was quite a bluesy singer and songwriter and then we came together and now we’ve got something that’s somewhere in the middle, with a little rock and roll maybe. How did you meet and become a band? Issy: We actually met through the Spiritual Bar community. It’s a little folk/blues bar in Camden which has a family of musicians. Archie had been playing there for quite a few years and I had been playing there for several months but we hadn’t really met. We had a mutual friend and I was doing a gig in West London and he came along and bought Archie, I think Archie was basically dragged there. Archie: I was dragged there as a wing man actually. This is the full story. My mate dragged me out to a gig on a random Wednesday night and said “I really need you to come because I fancy this girl called Issy Ferris and I need a wing-man”. So obviously I was a really good wing-man because I went along and then stole his bird, so he was really happy. What a good story! and you’re still friends? Issy: Yes, still friends! We all play at Spiritual Bar and that’s kind of where we grew. I wanted to be Archie’s backing singer so I joined his band. Archie: And then kicked out the other members. Issy: (laughing) So we started writing together and since then, we’ve kind of had our home up in Camden to rehearse and grow and develop and it’s been a bit of a whirlwind nearly two years. So you’ve been a duo for two years now, but you were both singing individually before? Archie: Yeah we were both doing our own thing, knocking around the London scene. We decided to concentrate on the duo exclusively after we took our demos and new songs that we’ve written to the producer Youth, who did our first EP called The Yellow Line. How did the London theme come around, what made you want to sing about London and being here? Issy: I think it was a combination of the music we were writing at the time. What we really love about this EP Made in Streatham is it’s a complete fragment of time. All the songs are so personal to that time, it felt like everyone around us was bummed out and getting sick of jobs and relationships and the stress of living in London. Which is why we wrote The Room and Sometimes is about that frustration too. In a more positive way the reason we wanted to go down a Streatham/London theme was because we really love living in Streatham and we’ve had such great support from local business, like Battersea Arts Centre, who have been a big supporter of us over the past year. We did this big live in Streatham series where we went around barbers shops and cafes and performed which got local businesses involved. There is good and bad bits about London but we’ve tried to embrace them all in this EP project. Archie: I think you naturally write about your surroundings as songwriters. I grew up loving a band called Squeeze, and we’re a different genre but lyrically they talk about London and where they’re living and they tell real life believable stories. We’ve tried to take that aspect on board because we feel that the best written songs are the ones you just listen too and you can really understand and relate too because they are quite close to home. When you write songs how does the process go? Do you go in together or do you come with different ideas? Issy: We really don’t have a formula. Sometimes we’ll sit down and we won’t have anything in mind and the two of us will work at it and something will happen. Or Archie will say “Ah I’ve got these lyrics” or “this guitar part” or I’ve written a poem and that’s all it is at the moment. The only thing we do make sure of is that we get the song to a point where it’s sounding great on acoustic guitar and vocals before any other instrumentation or production is done. We’ve got a make shift studio at home but before we go in there we make sure that we’re really happy with it, just the two of us. Everything has to embellish the core. You can’t put smoke and mirrors around something that you’re not happy with. Archie: That’s what we’ve been trying to do for our recent projects. That’s not the only way to write a song, who knows in a couple of years we could become a drum and base outlet! I mean you never know! Do you have a favourite song to perform or one that gets a good reaction? Issy: Ooh, maybe we have different ones? Archie: We should tell you after the show tonight! It’s a different answer to favourite song. Issy: Yes, Sometimes. But my favourite song to play live, that I’m most looking forward to tonight I think would probably be Superhuman. It’s a newer song which has a slightly harder, rockier sound. It’s still within the country blues genre and it’s very much a domestic argument song but there’s so much heat and fire in it and we haven’t played it a lot so i always get really excited about playing that one. Archie: I’m looking forward to playing London’s Blues. Issy: London’s Blues is always the last song we play, and actually that’ll be a great one to play because it’s been the best week ever for us with New Music Friday and it’s on the Spotify Top 50 Viral Chart so we’re riding on a high with that song I think. Issy: Yeah in a week it’s been mad, we’re chuffed. Issy: Ok so it’s not about the numbers.. But it does feel good! Is there a song you wish you’d written? Archie: Oh yeah, so many. Since we’re on the subject I’d have loved to have written a song like Up The Junction by Squeeze. Issy: I think it’s probably because we were watching the Simon and Garfunkel Live in New York the other day, we watched it twice in a day, and when Garfunkel was singing Bridge Over Troubled Water. And I don’t know why, he’s not a very attractive man to look at, but I was watching it and crying. Archie: Do you fancy him? Issy: No! That’s the point. I’ve heard this song millions of times and he’s not doing anything that special but it hits a cord somewhere deep down inside. And finally, can you give us any teasers as to what you’ll be up to this year? Archie: So the EP comes out at the start of February and we’re hopeful the next one will be quite soon after that, so you wont have to wait too long to hear that one. And we’re trying to develop the sound a little further and try to do something a little more Americana. Live drums a bit sort of warmer. Issy: I think this year for us is really about more writing, more playing live, getting more music out for everyone to hear and growing our fanbase, because we have such loyal dedicated fans, and to just grow that and really enjoy the ride.